As part of our Education Programme running in the schools of the Sarajevo Canton, we recently organised the contest for elementary school students to demonstrate the knowledge of the principles of safety with dogs, nature and responsible ownership of dogs in cooperation with the cantonal Ministry of Education, Science and Youth of Canton. 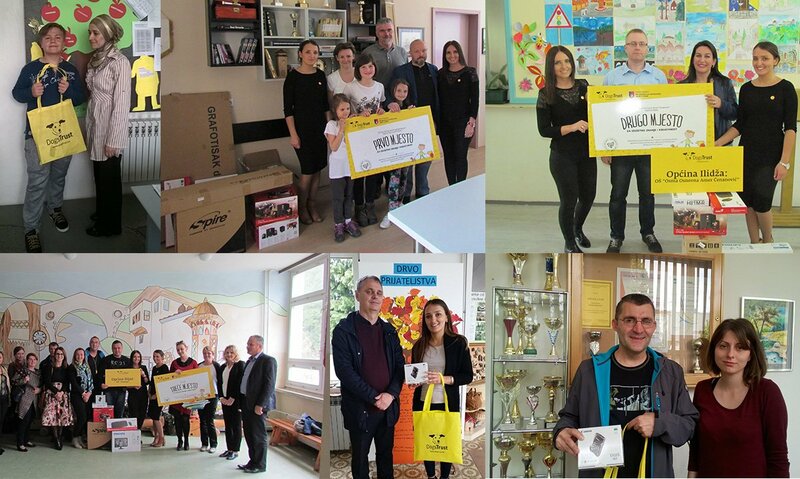 After the cantonal award winning ceremony on 18th May 2016, the Education Activists went to the schools to personally deliver the valuable prizes. – The primary school “Sejh Muhamed ef. Hadzijamakovic” from the Old City municipality won first place and received the equipment for a multimedia cabinet. – The primary school “Osma Osnovna Škola” from Ilidza municipality won the second place, and the school received a computer and video camera. – The primary school “Srednje” from Ilijas municipality won third place and received a computer and camera. All teams, both the municipal and cantonal winners will take a one-day trip to visit the school in nature in Sabici where a special programme will be prepared for them on 11th of June, 2016. According to the school principals, the prizes will be extremely useful for all students in the curricular and extracurricular activities. Congratulations to all participants for their exceptional knowledge and creativity they demonstrated through their work and we hope to see you soon with another fun winning game! Our Representative Office plans to continue with providing the significant support to the community because it believes the future is in the hands of children. The Education Programme for children is of great importance for the better safety of the children, but also as part of the sustainable solution of the current stray dog problem. Today’s children will one day become responsible and conscious citizens, which is a guarantee that this problem will not reoccur.